Product Photography – Wine Bottles – Arrowhead Winery, Northeast P.A. 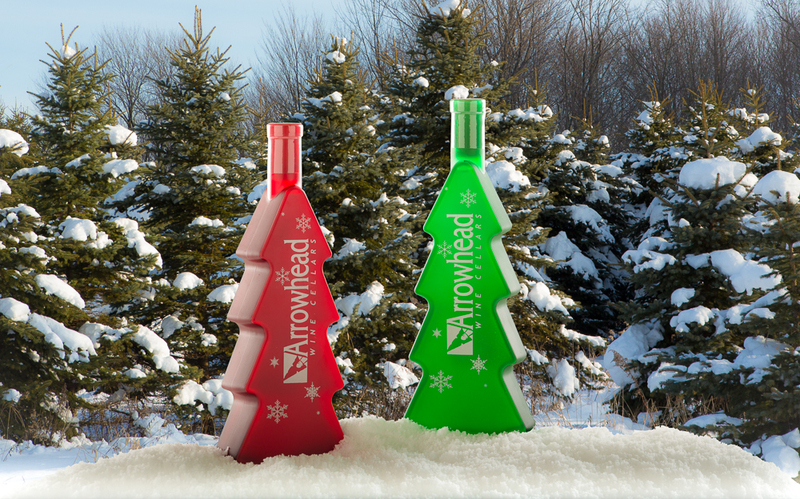 Three versions of a small product studio shot of a pair of Xmas tree shaped wine bottles from a local winery in Northeast P.A. called Arrowhead Winery on Rt 20. 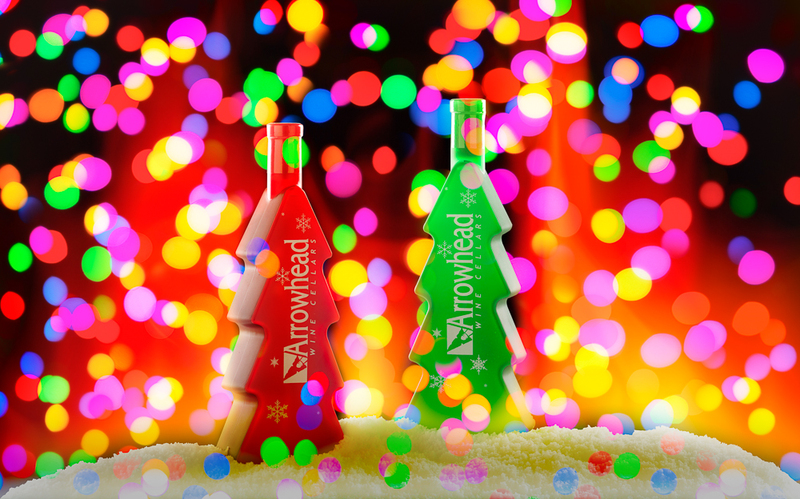 The bottles where placed on a table in front of white background paper and lite with two 30×40 soft boxes, one on each side of the bottle towards the back illuminating the back edges and contents of the bottle. Then I placed two 30×40 white foam core boards in front of the subjects to reflect lights back onto the lettering and front of the bottles. I bracketed the exposures and during the post processing I pulled one of the underexposed images and used the underexposed sides of the bottles and combined the proper exposure of the bottles and the proper exposure of the sides into one combined exposure in PhotoshopCC. 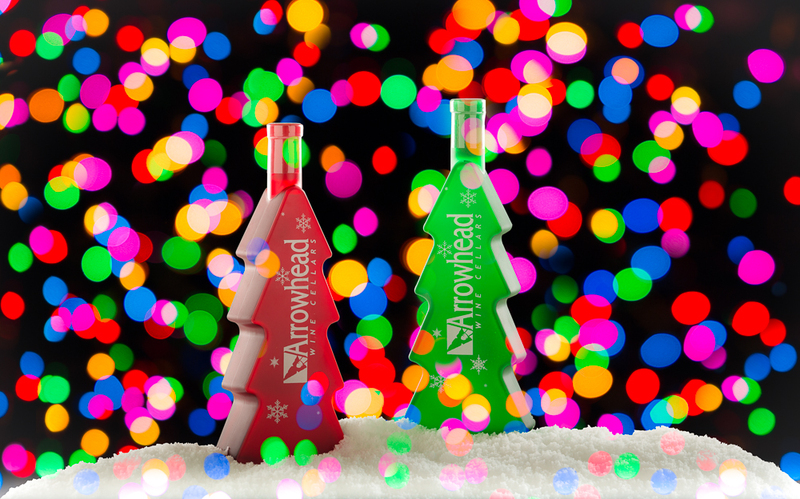 I used fake snow to surround the bottles and add a bit of seasonal element to the foreground image. The color lights where produced with Xmas lights hanging from a bar in the studio with the camera out of focus. The red and yellow streaks where produced with a preset from OnOne enhance. The bottles and snow where cut out of the studio background using the pen tool in PhotoshopCC. With the background removed it was easy to experiment with different backgrounds. Categories : Business Images, Chautauqua County N.Y., Photoshop Composite, Retouching, Small Product Photography, Westfield N.Y.